Videotapes of residents at two B.C. nursing homes suggest their falls are more likely to be caused by incorrect weight shifting or tripping, and not slipping as commonly thought. In Tuesday's online issue of the Lancet, researchers in British Columbia analyzed videos of 227 falls by 130 people. The videos were taken in public areas of long-term-care homes, such as dining rooms and hallways, in Burnaby and Delta between 2007 and 2010. The study looked at how and why falls occur, such as what activity led up to the tumble and how the person lost balance. "We show that the most common causes of falls are incorrect weight shifting and tripping, and the most common activities leading to falls are forward walking, standing quietly and sitting down," concluded study co-leader Prof. Stephen Robinovitch, of the department of biomedical physiology and kinesiology at Simon Fraser University, and his team. "Our findings emphasize the need to target each of these activities in fall risk assessment and prevention strategies," they added in calling prevention a "public health priority." Falls account for 90 per cent of hip and wrist fractures and 60 per cent of head injuries among people aged 65 and older. About 30 per cent of those in that age range who are living independently and half of those in long-term care fall at least once a year, studies suggest. The B.C. researchers said their findings are important because previous studies relied on seniors who fell or witnesses to accurately recall the circumstances of such incidents, which is difficult to do. As well, some people rationalized a fall as something that was unavoidable. Laboratory simulations of falls are usually by healthy young adults who were made to trip or slip. But slipping accounted for three per cent of the falls recorded in the B.C. work. Trips or stumbles were the second most common cause of falls in the study, at 21 per cent. Of those, a quarter occurred after a foot became caught on a chair or a table leg, which points to the need for staff to be aware of those hazards. Another 21 per cent of falls occurred during transferring. Robinovitch said that shows the need for exercises to strengthen arm muscles to prevent injuries to the hips and head. It's also important to ensure that people lock the wheels of devices such as wheelchairs to provide support when moving to and from chairs, the researchers said. Hits or bumps, 11 per cent. Loss of support, 11 per cent. For elderly people with sensory or balance issues, the researcher said, new environmental designs are needed. It's an area that the study's other leader, Fabio Feldman of the Fraser Health Authority in Surrey, is working on. The first idea is a special floor file that is thick enough to cushion falls without impairing balance. It is meant for use in high-risk environments like long-term-care residences and hospitals. Another approach focuses on the use of wearable hip protectors — discreet padding to cushion falls and reduce the risk of hip fractures. For falls that appeared to result from poor judgment or risk taking, Robinovitch said they're looking at the roles of medications and cognitive impairment on movement strategies. The team is also developing an educational video on fall injury prevention for nurses and care aides in long-term-care facilities. The video will include footage of people falling as case studies. In the Lancet study, the researchers said they weren't able to consider all factors in falls, such as lighting or distractions like talking. Whether the falls captured on camera represent all fallers is also unknown. The findings generally agreed with an early study of recordings of falls among the elderly at a long-term-care facility in Toronto, the researchers said. 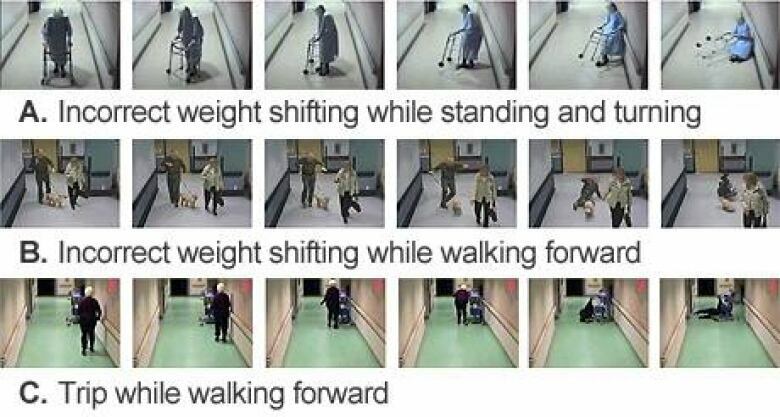 More than five per cent of falls in long-term-care facilities occur in private areas that video cameras miss, a journal editorial accompanying the study notes. Dr. Clemens Becker of Robert Bosch Hospital in Stuttgart, Germany, and Lorenzo Chiari of University of Bologna, Italy, suggested that other objective ways of studying falls are needed for those circumstances, such as wearing sensors on the body. Becker and Chiari cautioned that not all the findings might apply to seniors living in the community.